In a big building, or simply one with several walls, even the fastest high-speed internet will be reduced to an inconsistent trickle of limited access. In order to keep a WiFi connection as strong as it should be, people can employ extenders to boost the signal throughout a home. Having a WiFi extender is like having a router in every room: connections are fast and stable everywhere one goes. This guide will provide a selection of the best wifi extenders that are just right for every home, apartment, and workplace. 1.1 What Are the Advantages of Owning a WiFi Extender? 1.2 What Are the Top Picks? A WiFi extender connects to a primary internet router, either over the air or by ethernet cable and essentially acts as a secondary connection source. Where signals lose strength over distance and through walls, extenders make up the difference by catching and boosting their effective range. The ultimate goal of a WiFi extender is to eliminate internet dead spots within a building but many extenders also support wired connections to provide further networking power, accommodating additional computers, printers, and speakers. What Are the Advantages of Owning a WiFi Extender? WiFi extenders are useful tools for eliminating internet dead spots in a house, apartment, or business. Where walls and competing signals reduce a wireless internet connection’s potency, an extender allows individuals to have fast internet on all their devices no matter where in their building they are. As distance and the number of physical barriers grow from an internet router, the actual speed deteriorates. 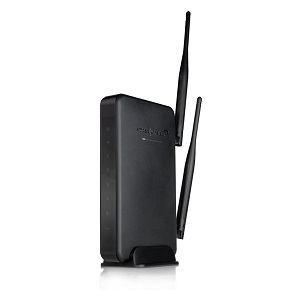 WiFi extenders are the simplest way to keep those signals consistent. A compact and easy-to-use WiFi extender, the Securifi Almond provides a strong and consistent signal at all times. Whether you’re using it to connect to your computer or printer, it is capable of extending a WiFi signal by 150 feet. Amped’s Smart Repeater makes use of two 600mW amplifiers and 5dBi antennas to extend coverage over 10,000 square feet. Its technology allows it to capture internet signals with stunning speed and clarity. It’s as consistent as standing right next to the router. The Nighthawk’s dual-band networking and dual core 1GHz processor deliver consistent WiFi signals over a massive range inside and out. Netgear’s FastLane technology allows the device to seamlessly integrate with both wireless bands at incomparable speeds and features five ethernet ports to further its versatility. The effectiveness of a WiFi extender is determined primarily by its range and speed, which is determined by internal hardware and antenna types. Devices will pick up and extend signals better if they can precisely distinguish the right signal from the dozens that are typically in the air at all times and amplify it uninhibited by distance and physical objects. Additional features, such as Ethernet ports, increase an extender’s versatility among streaming devices, game consoles, and personal computers. One of the most obvious desirable traits an extender can have is a broad effective range. WiFi extenders are meant to help keep a consistent internet connection throughout a home and for businesses, cover entire buildings. Individuals should check their space requirements and make sure the extender they want will match before buying. WiFi signals come in two frequency bands, most commonly 2.4GHz, which is a good range for passing through solid objects. However, 5GHz bands are gradually growing in popularity. They are less likely to experience interference from other signals in the air. An extender that is compatible with both frequencies is able to juggle between the two to provide the best consistent connection. Dual-band devices are a good long-term investment as most new mobile devices support the frequency. WiFi extenders don’t just boost the range of wireless signals but act as hubs for high speed wired connections as well. Used with streaming devices, game consoles, and smart TVs, extenders with Ethernet connections provide a more stable and direct connection. Ethernet ports come in a regular 100Mbps while Gigabit Ethernet is 1000Mbps. People with high-speed internet will want the latter to make the most of their service. WiFi extenders typically output at least two things: wireless internet and Ethernet connections. The number of Ethernet ports determines much of a device’s versatility but other ports, such as USB, are big convenience factors as well. USB ports can be used to set up printers and other network tools so that they can be accessed easily from any connected computer or mobile device. Capable of extending your WiFi signal by up to 150 feet, this Securifi Almond WiFi extender is at the top of its class when it comes to overall range. This makes it appropriate, not only for the majority of homes, but also a great deal of offices as well. The Smart Repeater extends wireless signals by 100 feet in every direction and stays consistent throughout. Its hardware is very well-engineered, with dual 600mW amplifiers internally and 5dBi high-gain antennas externally. Managed by a 620 MHz processor, this device utilizes each of its features to provide constant WiFi extension at virtually exactly the original speed. Where other models tend to falter at greater distances, the Nighthawk is good enough that even its lowest speed. 27mbps at 75 feet is significantly faster than its competitors at the same distance. Its three antennas and cutting edge internal hardware are distinctly capable of reading environments and delivering consistent high-speed internet over long distances and through multiple objects. The Nighthawk can extend a WiFi signal throughout an entire home or office building with unmatched effectiveness. Whether you place it in your basement, your main level, or in the second story of your home, this Securifi Almond WiFi extender will have you covered. Sporting dual bands, it provides signals of 2.4 GHz and 5GHz, allowing it to easily make its way through both thick and thin walls. The Amped Smart Repeater is another dual-band device that gets an extra boost from its onboard amplifiers and antennas. Its output strength is great enough that its 2.4GHz signals are near completely unabated by walls and obstructions, and its 5GHz connections at closer ranges are as clear as being wired. The Smart Repeater can provide clear service from just almost any location. Between its 2.4GHz and 5GHz band, the Netgear Nighthawk is capable of speeds up to 1900Mbps, combining 600Mbps and 1300Mbps respectively. Its 1GHz dual-core processor manages the device’s output efficiently and effectively. Each signal type is played to its strengths. At the lower range, the Nighthawk delivers wonderfully through walls and obstructions. And at 5GHz, it uses the lack of interference to provide better speed. Equipped with two antennas, the Securifi Almond is capable of running at speeds of up to 300 Mbps, making it about as fast as any WiFi extender currently on the market. Regardless of how many of its ports are being used, it will provide clear, undisturbed WiFi at all times. The Smart Repeater uses Gigabit ports capable of achieving ten times the speed of normal Ethernet. Combined with the device’s strong mechanics, its Ethernet ports make it a very forward thinking piece of technology with current and future high speed internet capabilities in mind. Connected to a streaming device, depending on the router speed the Repeater can handle several HD videos at once. The Nighthawk feature’s Gigabit Ethernet, taking full advantage of its own processing power and speed. Even with all ports in use, if the Nighthawk has a strong connection with a high speed router, any dip in efficiency is very hard to notice. The Nighthawk is fast enough that it practically serves as another router. It pairs great with smart TVs, gaming consoles, and other streaming devices. Equipped with 2 LAN ports and 1 WAN port, this Securifi Almond WiFi extender can be connected directly to a number of devices, from printers, to copiers, to computers, and more. While it may not possess as many ports as some extenders, it still provides more than enough to accommodate a smooth and consistent WiFi experience. The Smart Repeater has five Gigabit Ethernet ports, making it a solid choice as a secondary networking hub. Thanks to its impressive hardware, the Smart Repeater can keep WiFi connections open over the air. Too many devices at once will slow the network down depending primarily on the maximum speed of the original router. With five Ethernet ports and a USB 3.0, the Nighthawk is well prepared to serve as both an internet and media hub. The USB port can create a shared storage space, or connect to printers and other networked utilities to increase simplicity in a home or office. Through the Nighthawk’s user friendly configuration system, either option is very easy to set up. The N300’s dual-band connectivity makes it highly versatile for a device in its price range. Though it doesn’t pack any individual features that make it stand out, it comes with every feature most small living spaces need from a WiFi extender. Its software is easy to set up and the other installation it needs is plugging it into a wall. Placed in the right spot, it can be a very effective tool. Amped’s Smart Repeater is an impressive piece of hardware at a competitive price, with enough features and processing power to stay relevant for years to come. It provides great coverage at long range, eliminating WiFi dead zones indoors and giving homes added connectivity outside. Its fast and plentiful Ethernet connections make it an excellent choice for speeding up multiple devices. The Smart Repeater is relatively easy to set up, if not a little time consuming. The device features several additional novelty options such as TX beamforming and WAN portioning. But the casual user isn’t likely to need to learn about these things. The Nighthawk is leagues ahead of its competition and is likely to remain relevant for the next decade. It can handle speeds well beyond the average household service plan and extend those connections across a vast space without sacrificing much in the way of functionality. From antenna to processor, the Nighthawk is a device made to set the standard of excellence. Despite its extensive capabilities, the Nighthawk is a surprisingly simple device to use. The device is robust with features, not limited to standard extension and networking but also offering media server and access-control options. Each of its features, from basic setup to printer sharing can be fine-tuned in Netgear’s web based “genie” app. This product is our winner for best WiFi extender overall. WiFi extenders change the way people use technology in their homes. Being able to access the net regardless of physical location adds an element of comfort to work and leisure. An extender not only creates those opportunities, but keeps wireless signals as strong as if one was sitting in the same room as the core router. A powerful device such as the Netgear Nighthawk is the only way to unlock a service plan’s full potential. Instead of paying for extra for speed, an extender lets you to make the most of your plan and router.